Wintertime greens, grown in the protection of the hoophouse, are the best of the entire year. Research has been done into which vegetables can grow and thrive in the shelter from wind but still freezing cold temperatures that occur at night. While daytime temperatures soar to 100 on a sunny day, nighttime it is down to the outdoor temperatures: in the 20's last night and predicted in the teens this week. The list of vegetables that can withstand these conditions is not extensive. But it is wonderful to eat, roast, make into salad, cook as part of a stew, sauté in a pan, add to an egg dish, send through the juicer...good stuff. With just a little protection from the wind, plenty of good, local stuff can be consumed in the cold and darkness of winter. Yesterday we had a few visitors, and most were able to slog through the mud and visit the hoophouse. Sunny, bright, cold, windy and muddy outside, open the door to the unheated hoophouse and it is like a tropical paradise. The man cave, sunny and very warm, warm enough to take the chill away from all extremities. And then the harvest! 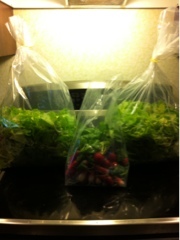 Here, Tom Thumb lettuce and Cherry Belle radishes. 10 pounds of yum.